Ms. Biz Mornings attendee Sherry Samuels, a life coach and motivational speaker, says networking is essential to business growth. According to the National Association of Women Business Owners, there are about 11.6 million women-owned businesses in the U.S., and women make up about 40 percent of new entrepreneurs each year. Maryland is home to the highest percentage of women-owned businesses among the states, with 32.6 percent. Networking is crucial for advancing a career, according to a recent Wall Street Journal article. But women sometimes have difficulty creating and joining existing networking activities. The main reason, the Journal said, is the dearth of women in positions of power who can make introductions and referrals or who can mentor other women. Despite this, women are persevering, seeking out mentors and offering each other a hand up in business, particularly in Howard County. Lisa Stearns, a business coach and motivational speaker, started Ms. Biz Mornings in 2013. Ms. Biz was started by Lisa Stearns, a business coach and motivational speaker, who has become a mentor for Samuels. 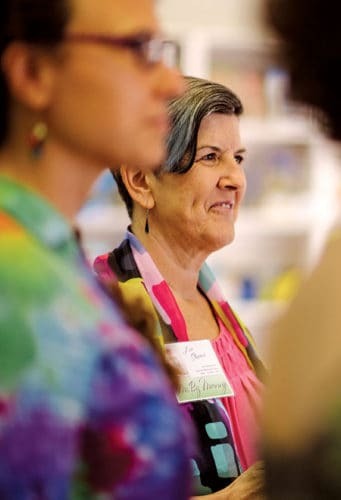 Stearns started Ms. Biz Mornings in 2013 to support what she calls “heart-centered women in business” and to help them with networking, marketing and establishing a community. To ensure that cost isn’t a barrier, Stearns sets the fee at just $5 per event. In addition, members host meet-ups at their businesses, helping them with exposure. Many small businesses in Columbia are tucked away in village centers and industrial parks, she points out. “You can’t see them and don’t know where they are,” she says. An event host may end up with 20 or 30 women who previously didn’t know they existed. Karen Pitsley, owner of Transforming Architecture, chats with other members of the Business Women’s Network group at the monthly meeting held at Cured restaurant in Howard County. 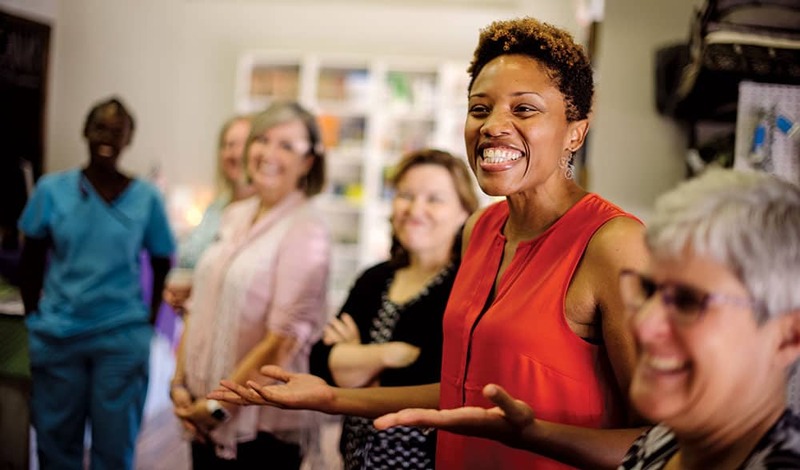 In recent years, female-focused networking groups like Ms. Biz Mornings have cropped up around Howard County. But one group has roots that go back many decades. 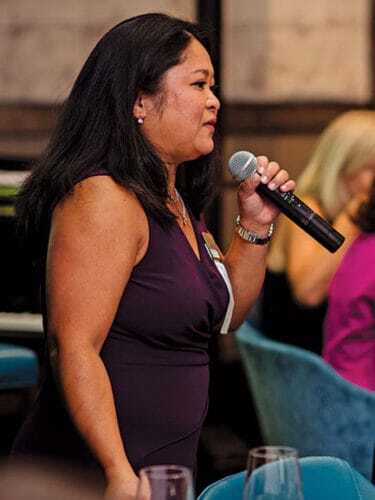 Since 1979, the Business Women’s Network (BWN) of Howard County has offered opportunities networking and community service opportunities to hundreds of women. 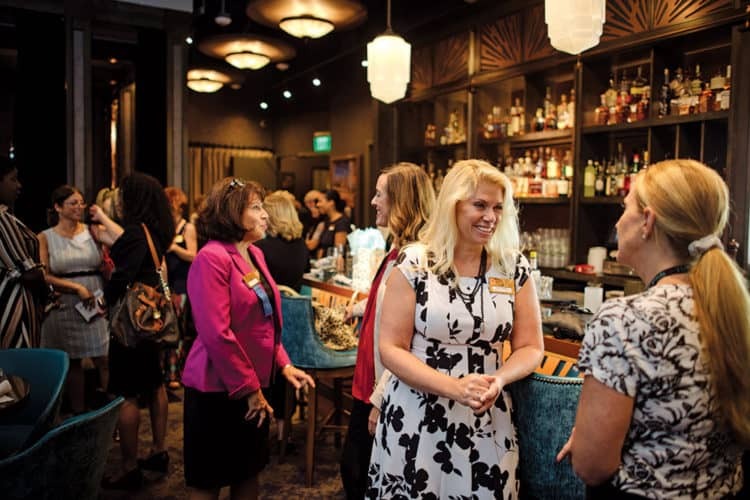 More than 200 women from different industries, ages, backgrounds and stages of their professional careers are part of BWN and gather to support the successes and well-being of other BWN members at least monthly. Current BWN Board President Faith Wachter, who owns an eponymous consulting and social media solutions company, says that regular lunch meetings have time set aside for members to share testimonials about the impact they’ve had on one another. The organization was founded in 1979 by a group of stay-at-home mothers who were looking to help each other re-enter the workforce. They began by meeting for lunch at Tersiguel’s on Ellicott City’s Main Street, talking about what jobs were available locally and how they could help each other find new opportunities. Then-Howard County Council members Liz Bobo and the late Ruth Keeton were integral in creating the group that quickly attracted new members. By the mid-1990s, the network incorporated as a nonprofit organization dedicated to promoting the advancement of women in all sectors of the business community. Recently, Wachter says, the organization has started to focus on networking skills. “Networking can be daunting,” she points out. But it’s essential to success in the business world. When Lisa Dolce founded Pinnacle Career Resources, Inc., in 1999, her intention was to help anyone who was stuck in an entry-level job to move forward, advance in their career and earn a higher wage. Dolce’s background is in career coaching; she worked for several years developing work experience programs at Howard Community College prior to creating Pinnacle. She designed Pinnacle with a network of community partners, including the college, and offered computer training and other professional services. She quickly realized that most of her clients were women, and many were single mothers. They came from all walks of life, educational levels and cultures. “Many did not know their value and what they had to offer in the world,” Dolce says. So she began to add such services to Pinnacle’s offerings as small group empowerment circles and resources to help women to gain confidence. Over the years, Pinnacle has helped more than 2,500 Howard County women improve their job prospects. In 2015, Dolce started The Launch Studio, a new division of Pinnacle Career Resources that helps female entrepreneurs with small business startup coaching, management consulting and training. One of its offerings is helping women find affordable office space, so they can go from “working at their kitchen tables to a professional environment,” Dolce says. Women’s Giving Circle of Howard County Launched in 2002, the WGC of Howard County raises money to make grants to donate to programs that benefit women and girls. womensgivingcircle.org. Techies and Tees. This new networking group connects you to golf lessons so you can build relationships on the golf course. @techiesandtees. American Business Women’s Association (AWBA) This national organization, with a mission to bring together business women of diverse occupations, has branches throughout the U.S. For information on the Maryland chapters, go to abwa.org. International Association of Women This online networking organization offers its members the opportunity to network both online and in person. Benefits include access to educational opportunities, webinars and e-conferences. iawomen.com. Women President’s Organization (WPO) If you are owner or CEO of a successful business, you may qualify for WPO membership. Chapters meet regularly to explore strategic and operational issues that will help move their businesses forward.